This is another of my articles to help people who get terrified by news stories, which often get exaggerated titles even by responsible journalists. In this case many are scared that withdrawal from the INF is going to lead to a nuclear war. So, yes, it's in the news now that US has announced it will withdraw from the INF treaty, and Russia has responded with an identical move the day after. The US withdrawal has been expected for some weeks now and the Russian symmetrical response is hardly much of a surprise. IT IS NOT A DECLARATION OF NUCLEAR WAR. This is an example story. This is by Bloomberg who are normally very reliable. You thought the threat of global annihilation was history? Better think again. Hard. In a way it is accurate but try to think how this is read by someone who is already scared of nuclear war? Perhaps so scared they may even be contemplating suicide because of their fear? Maybe a youngster also. Journalists tend to forget that nowadays stories like these, especially the headlines, are read by young teenagers, and even younger children, on their mobile devices in Google News and other news aggregates. The story is indeed reasonably accurate, but the title is very scary to those afraid of nuclear war. Also while what it says is accurate, it creates an impression of imminent risk of nuclear war to a vulnerable reader in the article too, mainly because of the things it omits. These are journalists. They hype up the headlines to get clicks and views, even in the most sober of articles. Also many of these stories are opinion pieces and they will tend to stress risks and use an element of hyperbole (exaggeration for emotional effect like 'I could eat a horse'), in order to try to convince decision makers to reverse this decision. So I'm writing this to counter some of the things you may get as an impression after reading articles like this. Things they don't say, as they build up the case for a scary picture, either for reasons of political persuasion, or for sensationalism, or just to attract your attention amongst the many competing headlines for the day in news aggregates like Google and Apple news and Facebook trending. But the Daily Express shouts "world war 3" many times a year. First, one thing most of these stories don't tell you is that the treaty still remains in force for six months as part of the formal withdrawal process. During this time, both Russia and the US will be under pressure from Europe to find a way back. Also the US are under pressure from Russia too - Russia were not at all keen to withdraw, and kept asking the US to remain within, even though to do so would give them the go ahead to develop INF weapons themselves openly (if it is true they already made them secretly). Meanwhile leading figures on both sides urged the US to remain within. This is an article in the Washington Post by Gorbachov, former president of the Soviet Union, and George Shultz, former US secretary of State both of whom participated in the original INF treaty. The treaty is "significant for international security and security in the sphere of nuclear arms, for the maintenance of strategic stability,"
if the US continued to behave "clumsily and crudely" and backed out of international agreements, "then we will have no choice but to undertake retaliatory measures, including involving military technology ... But we would not want to get to this stage,"
What nobody knew back then was what that response would be. Now we know. This is why I say that their withdrawal would be no surprise, what they would do was not known, but something like this is hardly unexpected. At Saturday's meeting with his foreign and defense ministers, President Putin said work would begin on creating new weapons. These, he said, included a land-based version of Russia's sea-launched Kalibr cruise missile, and new hypersonic weapons which can travel more than five times the speed of sound. But Mr Putin said Moscow would not get dragged into an expensive arms race, and would not deploy short- and medium-range missiles unless US weapons were deployed there first. The view of Europe on what happened was clarified in a press conference on 25th January before either withdrawal, by NATO Secretary General Jens Stoltenberg. He said that even if Russia doesn’t come into compliance on 2nd February (which they didn’t), the process won’t be completed until six months after that, so there is a new opportunity before the withdrawal process is completed for Russia to come into compliance. Also he said that they have asked for their military commanders to look at the consequences of a world without the INF treaty in which Russia continues to deploy these weapons. He says he doesn’t want to speculate now because the focus is on keeping Russia within the INF. But they would need to look for new arms control initiatives. He also talked about the US systems that are alleged by Russia to be in violation of the INF. He just said they are not in violation. These are launch systems in Romania and soon to be deployed in Poland that can fire treaty breaking weapons - but only if they are supplied with them. Since they are not, they are not treaty breaking. That’s NATO’S view on them anyway. Russia says they are treaty breaking, because they could be supplied with INF breaking weapons. Of course Russia also claims its own weapons are not. On March 8, 2017, General Paul Selva, the vice chairman of the U.S. Joint Chiefs of Staff, confirmed press reports that Russia had deployed a ground-launched cruise missile that “violates the spirit and intent” of the INF Treaty. In late 2017 the United States for the first time revealed both the U.S. name for the missile of concern, the SSC-8, and the apparent Russian designation, the 9M729. Russia denies that it is breaching the agreement and has raised its own concerns about Washington’s compliance. Moscow is charging that the United States is placing a missile defense launch system in Europe that can also be used to fire cruise missiles, using targets for missile defense tests with similar characteristics to INF Treaty-prohibited intermediate-range missiles, and making armed drones that are equivalent to ground-launched cruise missiles. The NATO Secretary General Jens Stoltenberg gave no details yet so we can only speculate on what ideas they have in mind if or when the INF treaty finally ends, but perhaps they can have some limited agreement not to stage INF forces in Europe? The US seems to be mainly interested in INF forces in China, at any rate, they are doing it against the wishes of their European allies, so they can’t have Europe as top priority in this decision. So, withdrawing from the treaty may not lead to a build up of INF forces in Europe. Especially if Europe and Russia can come to some sort of agreement to prevent it. 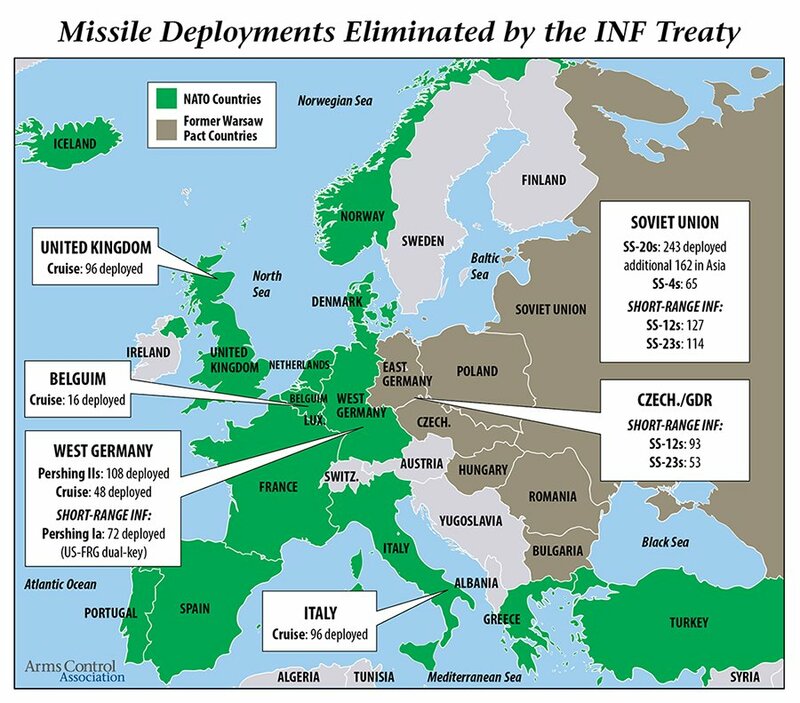 Withdrawing from the treaty takes us back to a situation like the one before the INF treaty was first signed - but not as bad as back then, not for nuclear weapons in Europe, when both Europe and Russia had several hundred cruise missiles with nuclear weapons installed. Gorbachov and Reagen signing the INF treaty in 1987. They eliminated several hundred INF breaching cruise missiles in both Europe and Russia. Details see this Arms Control fact sheet, from this article. We have far more transparency now. We talk to people from Russia over the internet in real time. Our reports are over there filming a major fire in a supermarket in Russia. Putin gets Western reporters following him around asking questions and this is shown on our TV channels. This sort of thing would never have happened back when I was a kid in the middle of the cold war. Also, our countries globally are much more enmeshed together through trade, economics, etc. Back in the very early days of the cold war in the 1950s onwards, there was some plausibility in the idea of a country trying to win an pre-emptive nuclear war. Now the idea makes no sense. Robert Walker's answer to Are we heading towards World War III? Also, nobody wants nuclear war. At the beginning of the cold war there were no treaties at all. After the INF treaty expires, we still have New START. When that expires on 5th February 2021, then we have no treaties to limit numbers of nuclear weapons worldwide, but that still DOES NOT MEAN NUCLEAR WAR. All it means is a time of possible build up to more nuclear weapons again. But we may not have the same build up as during the cold war anyway even with no treaties. The US and Russia are not in a situation where either expect to win a war with each other and the main concern of both is with the nuclear weapons of China, Iran, North Korea, Israel, and other countries, and each other’s use of nuclear weapons to protect countries outside of their national territory. They each have many more weapons than China or any other country with nuclear weapons. It might be that the next president after Trump immediately works to get back into nuclear reduction talks. The New START treaty expires one month after the end of Trump’s first term as president in January 20, 2021, so if he isn’t re-elected, it will be the job of another president to decide whether to stay within it. Or if not, if Trump or someone similar is the next president in 2021, then yes, there could be a new arms race after that. But that still doesn’t mean nuclear war. We’ve been there before. It just means a new arms race. Not good. But it’s not an automatic war. Indeed it remains the same situation. Nobody wants nuclear war. But this is looking so far ahead. We just have to see where this takes us. Most of those who contact me are scared that this may lead to an immediate nuclear war. It’s perhaps not surprising with Trump so volatile in his decision making. But no, he can’t do that. First, neither Trump nor Putin want a nuclear war for the same reason you don’t want one. Even if you were totally cynical about Trump, nuclear war is not good for him or his family, golf courses or hotels! Meanwhile Putin is a shrewd calculating person, if anything, not someone who rushes into things out of anger. A nuclear war would of course be a disaster for Russia just as it would be for the US. As for Trump then he is much more impulsive and hot headed than Putin. But even if he were to wake up and spontaneously order a nuclear attack in a moment of rage at some adversary - which at some point some were scared he might do - the generals would just refuse the order. Because it would go against the 4 Basic Principles of the Law of Armed Conflict. In short it would be a major war crime to do that. General Kehler made it clear a military general not only could refuse such an order but would be obligated to refuse it, on the remote chance he or she receives such an order. (2) Proportionality – “Loss of life and damage to property incidental to attacks must not be excessive in relation to the concrete and direct military advantage expected to be gained. Can Trump order a nuclear attack on civilians in North Korea in peace time without Congress approval? General Kehler says no. So over 30 years that’s roughly equivalent to 2 years so about 6–7% of its military budget is on weapons to a first rough estimate. Russia is not the former USSR and doesn’t have the vast resources and budget it had. It will struggle to compete with the US in a nuclear arms race. Is already spending perhaps double the percent of its total military spending on nuclear weapons compared with the US. And meanwhile the US is far more budget conscious, and will find it hard to justify the budget increase if a president wants to do a nuclear arms race. WHAT ABOUT THE SMALL NUCLEAR WEAPONS? Well, those tiny “tactical” nuclear weapons have been constructed and the US used to have them, even tested them as they might be used in battle in one test and had thousands at one point. Explosive yield measured not in kilotons, but only in tons, smallest with a yield of two tons of TNT, and kill mainly through the intense radioactivity. Davy Crockett (nuclear device) - a tiny nuclear weapon with a yield of only two tons fired from this device. The nuclear round fired from it was 31 in. (78.7 cm) long with a diameter of 11 in. (28 cm) developed in the late 1950s. Deployed by US army from 1961 to 1971. No longer exists. Russia seems to be reducing its numbers of these really tiny nuclear weapons. But if the US increases presumably Russia would too. However, they are not developing weapons as small as this yet. Trump has only ordered a small batch of small ones made and not as small as this. Not two tons. Probably five kilotons. That is a little under half the yield of the one dropped on Hiroshima (estimated from the amount of damage at around 12 kilotons). Still a devastating explosion by most standards, nothing like the mini nukes of the Davy Crockett bomb. Its just a test batch, simple modification of the Trident missiles for low yields. Congress have to be convinced to come up with the funding and the article is saying the democrats may well oppose it. We are way below the nuclear weapons levels of the height of the cold war and it would take a while to build up again if that does happen. And even if it does that also is not nuclear war. It will take six months to withdraw, US remains in New START until the end of Trump's presidency, Europe are trying to get Russia to reengage and Trump to roll back. If those attempts to save the treaty do fall through as is likely then Europe will be trying for some other arrangement with Russia in Europe, which may be possible as both Russia and US are probably most concerned about China rather than Europe. But they have refused to be drawn on what exactly these arrangements might be like because they are focusing on trying to reverse the INF withdrawal. Finally, going into the future it needs to be replaced or updated to something that also involves China since at the moment it is exempt from it which is at least part of why US wants to withdraw. US to withdraw from INF nuclear treaty - NOT START OF A WAR - what’s next and what’s the background to Trump’s announcement? If you are scared: Seven tips for dealing with doomsday fears which also talks about health professionals and how they can help. Facebook group Doomsday Debunked has been set up to help anyone who is scared by these fake doomsdays. Do message me on Quora or PM me on Facebook if you need help.